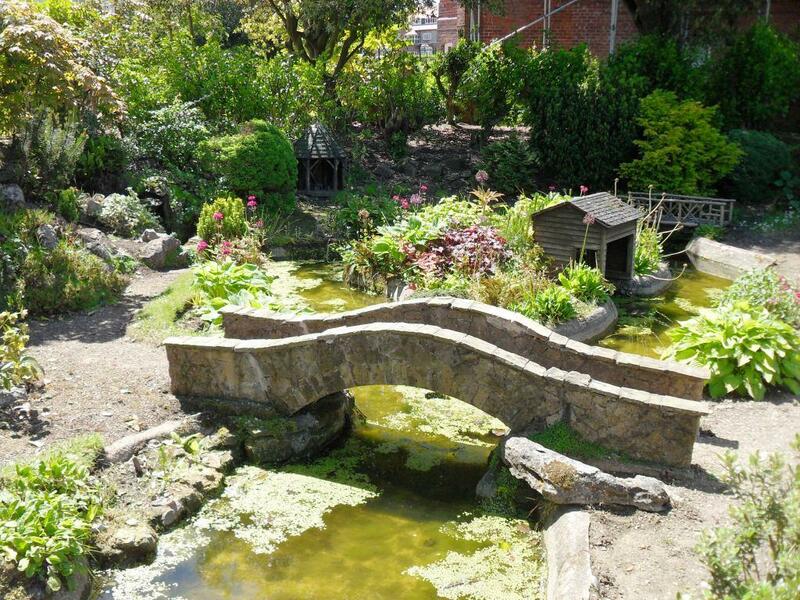 In 1911, Albert Shuttleworth presented to the town the Miniature Gardens, which became known as Shuttleworth Gardens. In 1911, Albert Shuttleworth donated the Holbeck Clock Tower to commemorate the coronation of George V.
Just below Holbeck Clock Tower a pavilion was erected in 1928 at the Putting Green, which had been made about ten years earlier. 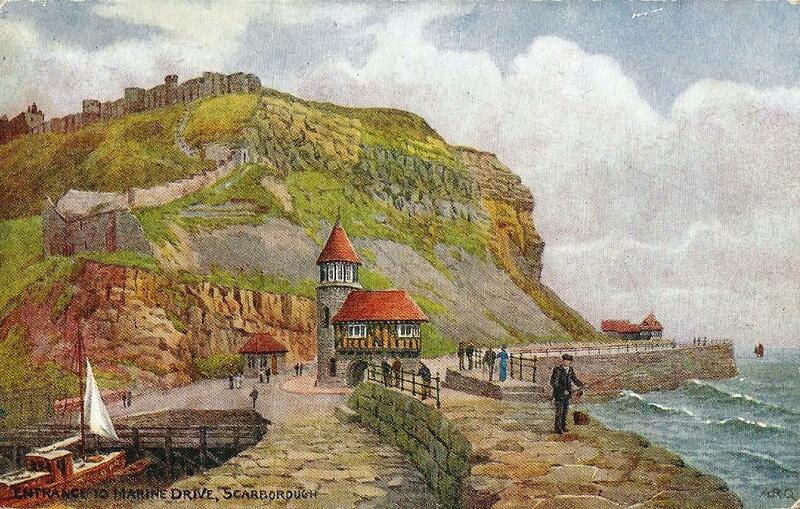 In the mid 19th century, cast iron Egyptian-style gate piers with bound reeds of papyrus were erected as a gateway to South Cliff from the Esplanade. The classical styled loggia was designed by Harry W Smith when he laid out the Italian Gardens in 1914. The Tidal Pool at Dickinson's Point has been filled in and has been made into a Star Map. The mineral spring was discovered in 1626. In 1862, a summerhouse, probably designed by Joseph Paxton, was built in the grounds of the Swiss Chalet. It had been used as an electricity sub-station but has now been restored. 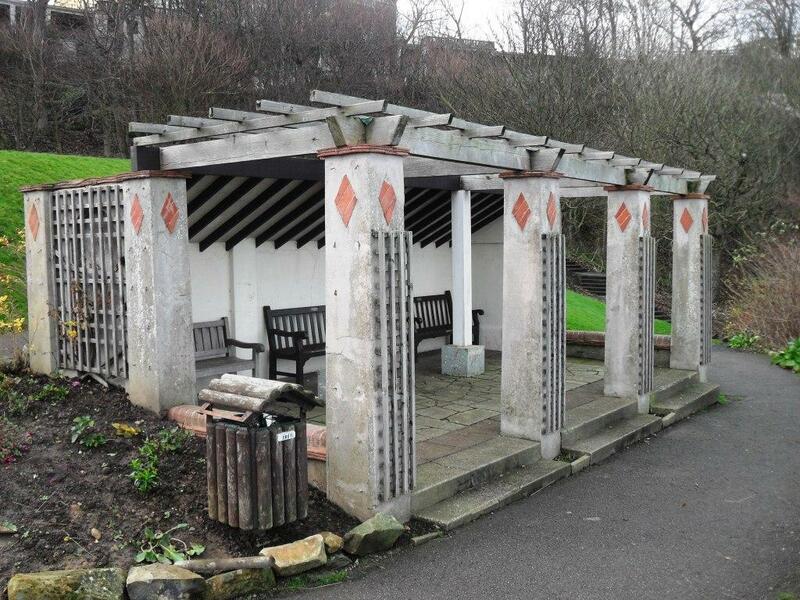 The arbour near to Spa Bridge has recently been restored. The Swiss Chalet was built in 1860 near the northern end of Spa Gardens and was occupied by the Spa manager. It was acquired by Scarborough Council in the 1950s and was let to the town clerk's secretary who lived there until she died in 2006, aged 93. It was for sale in 2007 for £250,000 with a 125 year lease and attracted more than 620 potential buyers. It cost between £150,000 and £200,000 to renovate as a holiday home for the staff of Denton and Denton. The Rotunda was built for the Scarborough Philosophical Society to be of 'such magnitude and character, as might comprise the whole of their collection in one room, to hold meetings at which scientific communications will be received and to establish a library'. The design was by William Smith, 'the Father of English Geology', and the architect was Richard Sharp of York. The foundation stone was laid in 1828 and the museum was opened to the public in the following year. The footbridge was originally private and linked Londesborough Lodge to the town over Vernon Road. This underground chamber in a garden at The Crescent may be a Grotto. The Strawberry Arch was re-erected in the garden of Crescent House, which belonged to Henry Edward Donner between 1924 and 1942. The arch and wings was the entrance to Strawberry Gardens at Falsgrave. The garden wall near Strawberry Arch has a bastion-like projection. Wood End was built in 1835 and was bought by Lady Louisa Sitwell in 1870. The Sitwell family ladies painted jars in the first floor of the four-storey tower and sold the ornamented jars at charity bazaars. The tower has recently been restored. Albert Denison (1805-1860), 1st Baron Londesborough, was the first President of the Archaelogy Association in 1844 and bought Grimston Park in 1851. His interest in archaeology didn't prevent him from building a tower on Seamer Beacon and possibly using stone from a stone circle nearby. The Tollhouse was built in 1906 at the entrance to the marine drive. Hairy Bob's Cave is said to have been carved out by navvies during the construction of the Royal Albert Drive, which was completed in 1890. One story is that 'Hairy Bob' was a man who sold yellowstone for cleaning doorsteps and he lived in a cave to escape from his wife. It is thought that at one time there was a door and windows at the front of the cave. A 13th generation Scarborough man has emailed me with a story that I will quote in full. ''The story was that Hairy Bob was a local drunk, constantly in trouble with the local authorities for outbursts of cursing and drunken ways. After several nights of drinking, on one dark night, he was arrested and taken to the castle prison, on the promise he could go free the next morning, after sobering up. He wasn't happy and started his usual rants, all the way there. He cursed them that God didn't look kind on their actions, as this was only his way of celebrating finishing his latest job. Thank you Joe for such a good story! The huge steel sculpture of Freddie Gilroy is by Ray Lonsdale from County Durham. At the age of 24, Freddie was one of the first soldiers to relieve the Bergen-Belsen concentration camp in 1945 where they found 60,000 prisoners. Roy Lonsdale became a friend of Freddie Gilroy, a former miner, who died in 2008. The sculpture had been on temporary display in 2011, and after a campaign to keep it in Scarborough, the £50,000 cost was gifted by Maureen Robinson. See also 'High tide in Short Wellies' at FILEY. Peasholm Park was designed in the Japanese-style by borough engineer, Harry W. Smith, between 1912 and 1829. The 30 feet high two-storey Pagoda in the middle of the lake was built in 1929 and designed by George W. Alderson. On 30th October 1999, the Pagoda was destroyed by arsonists and the burned out shell was demolished. The new Pagoda, that had suffered another arson attack during construction in 2006, was built using fire-retardant wood. Oliver's Mount is a prominent hill overlooking Scarborough. 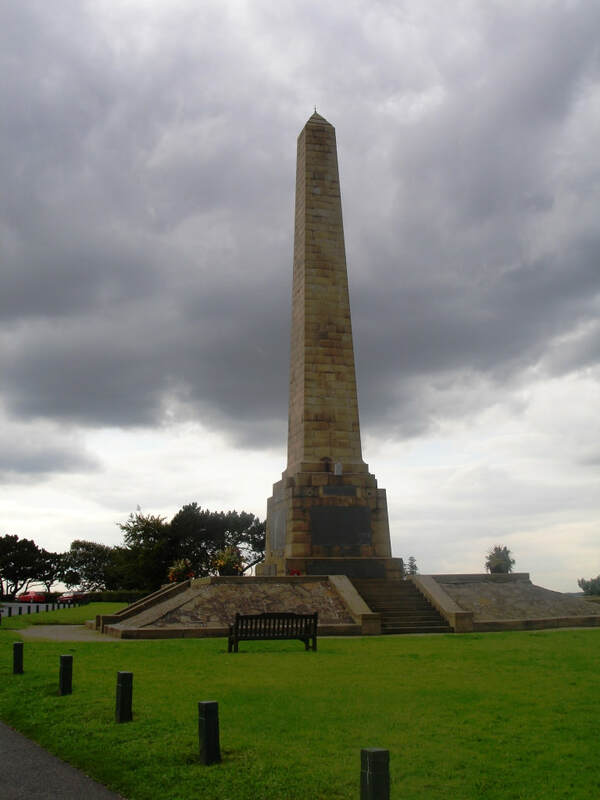 The 76 feet high obelisk is a war memorial with names of about 750 Scarborough people killed in the First World War. This postcard was posted in 1927. 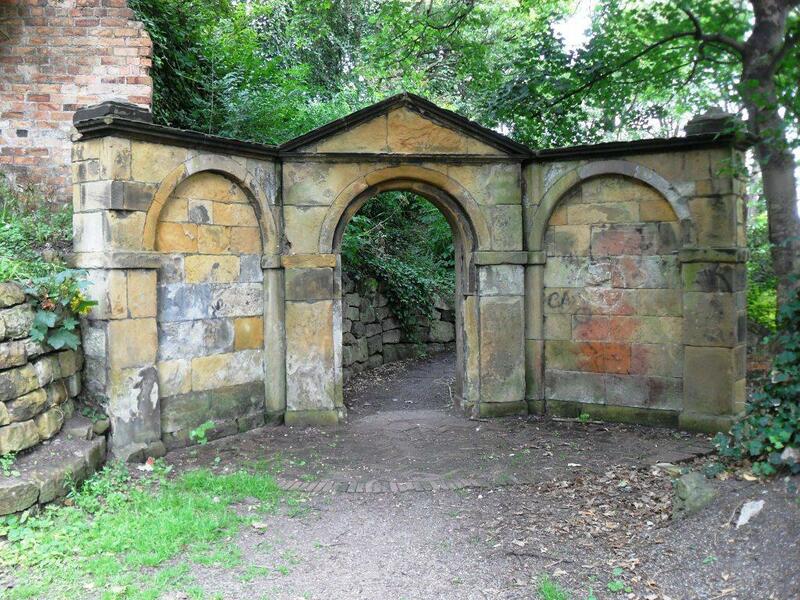 The present well house in Falsgrave Park probably dates from the 18th century but there is evidence of an earlier conduit, which may have been recorded in 1339 as the 'Franciscan Spring'. In 2005, the Friends of Falsgrave Park obtained funds to have the building restored. A stone circle has been recently erected at the top of Falsgave Park. There were at least five market crosses in the medieval town including the Corn Cross and the Rede Cross. The badly eroded pillar known as the Butter Cross perhaps replaced an earlier one, and may have been a re-used pinnacle from a church such as the friary churches after they were demolished in 1537, or from the nearby Chapel of the Holy Sepulchre which was demolished in 1561. The present windmill may have been built in 1785 to replace an earlier one. It stood in countryside on common land and was known as Common Mill. The last miller was Albert Price Harrison who lived at Calthorpe House. A windmill on the site was used as an artillery observation post during the Civil War in 1645. A model prison was built in 1866 and designed in a Gothick style by William Baldwin Stewart and Alexander Taylor. It cost £12,000, and the 36 cells were initially designed to hold 36 male and 12 female prisoners as well as 4 debtors or juveniles. The Prison's Act of 1877 led to the prison being closed in 1878.